New Orleans The fact that ACORN International has been fighting hammer and tong in Canada and other countries and with Local 100 United Labor Unions in the USA with Comcast, Time-Warner, and Cox to expand internet access to lower income families might have been what led me to notice an article about “bandwidth for the poor.” Interestingly, bandwidth here was something more akin to talking about the concentration, stress, and intensity required for lower income families to deal with the most basic necessities of survival, a point that is so obvious and fundamental, that many folks may just stumble past it. Sendhil Mullainathan was writing in the Times about research done with several other professors about a study they had done on how the brain works on thinking processes that explain decisions and due to economic circumstances can cause such psychological stress that it literally lowers the IQ by ten points. Studying India sugar cane farmers only paid once per year after a harvest, they found that by comparing farmers to farmers, depending on the time of the year, the farmers felt either rich right after the harvest or stressed out and poor right before the harvest, and in fact their IQ’s measured 10 points less before a harvest, which is significant. The researchers argue convincingly that it is not simply a situation where poor people make bad decisions, but that their poverty itself lowers their mental capacity or what they are calling “bandwidth” that would allow them to make better decisions. Another piece I read recently about the work of the National Diaper Network, talked about the strain of lower income families dealing with something seemingly simple like diapers and the attendant costs that can come with providing this fundamental necessity which can create constant demand, stress, crying, and costs ranging to $100 per month. Many poor families don’t own washers that would allow them to go with cloth diapers and many laundromats in poor neighborhoods ban washing soiled diapers in their machines. 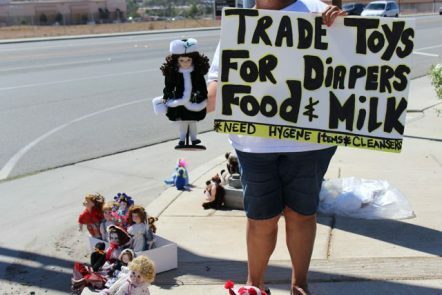 Corner stores often break open a box and sell an individual diaper to desperate mothers for $1 a piece or too many moms stuff old t-shirts where the action is, hoping for the best. If a poor family is worried constantly about the next meal and the next diaper with crying children, what time do they have left for good decisions, much less paying exorbitant rates for the internet to increase access to that other kind of bandwidth. The professors didn’t use diapers as their example, but the irony of universities saying that they want more low income students but then creating complex applications and financial need forms that are 10 or more pages in length. Essentially they are asking if more low income diversity in higher education is really an objective, then why not make the application one page, rather than have families defeated from the beginning. All of this is important food for thought, but that assumes you have enough food to have the time and energy for thought. This entry was posted in Citizen Wealth, Financial Justice and tagged diapers, Internet, IQ, poverty by Wade. Bookmark the permalink.